Before the Alcázar burned down, this understated convent was its treasury, connected by a concealed passageway. In 1611 it was inaugurated as a monastery by Philip III and his wife Margaret of Austria, and rebuilt to a design by Gómez de Mora. 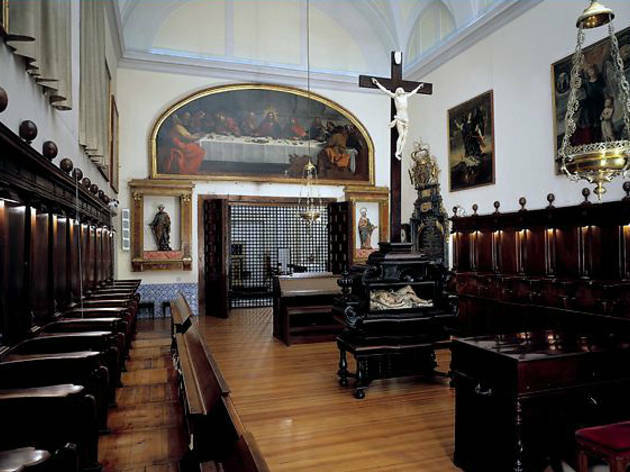 However, much of the original building, including the church, was damaged by fire in 1734 and rebuilt in a classical-baroque style in the 1760s by Ventura Rodríguez. It still contains a community of around 20 enclosed order nuns, but most of the building is open to the public. Although not as lavishly endowed as the Descalzas Reales, it contains a great many pieces of 17th-century religious art, the most impressive of which is Jusepe Ribera's shimmering chiaroscuro portrait of John the Baptist. 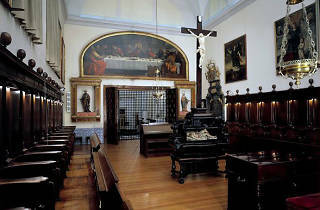 The Encarnación's most famous and memorable room, however, is the reliquiario (relics room). In its glass casements are displayed some 1,500 saintly remains, bone fragments and former possessions of saints and martyrs, in extravagantly bejewelled copper, bronze, glass, gold and silver reliquaries. Its prize possession is what purports to be the solidified blood of San Pantaleón, kept inside a glass orb. The blood reportedly liquefies each year from midnight on the eve of his feast day, 27 July. Note that visits are by guided tour only, and tours leave 30 minutes after the first person signs up; so there's little point turning up as it opens.